Peppermint Blue One Year Anniversary – FREE GIFT! Once Upon a Time at the Vicious Mall – I sent out a group IM for models. I said that the first 10 girls to respond would get to be models and of course keep the clothes. Alice07 Barzane responded, and despite her little English and my zero Japanese, we had a splendid afternoon taking pictures of clothes that would be for sale at Vicious Fairy. Alice started coming to our events, and shortly after told us she was opening a bar. The Vicious Crew picked up and pulled our groups over to the Grand Opening of Peppermint Blue. We had one hell of a party. I consider Alice07 Barzane to be one of my true, real friends in SL. I simply adore her and the kindness with which she distributes her assistance packs. Her heart is huge, she pays tons out in camping to allow people to have a more enjoyable experience on the grid. We muddle through still, between her English and my zero Japanese (remarkably – her English is really getting good, my Japanese is still nonexistent). But I look forward to each and every visit with Alice, and the emails we exchange in friendship. Imagine my surprise when she told me that it was the one year anniversary of the day we met. I had to choke back a sob – because this is like Alice, she is thoughtful to a fault. And she gave me a gift. This wonderful dress from Bingo! – which will be available as a SPECIAL gift at the One Year Anniversary of the fabled Peppermint Blue Fashion Bar! 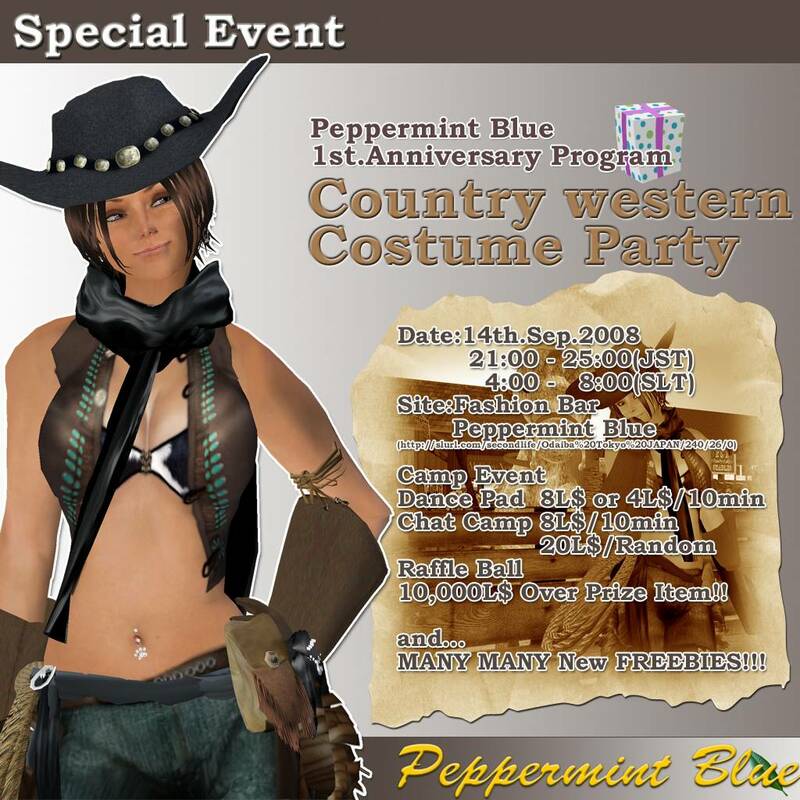 I would like to cordially invite ALL of you to attend the One Year Anniversary Event at Peppermint Blue. I will break form a bit and include the party invitation after the fashion details. Early warning – Alice’s events fill the Sim EVERY TIME – get there early!! To my friend Alice07 Barzane……PACHI PACHI! OMEDETO! Click Here to see the Entire Fashion Shoot in the NEW Unreleased Peppermint Blue Freebie! This entry was posted in Second Life and tagged Bingo, Garments, love soul, mingo, Peppermint Blue, peppermint blue freebie, Second Life, shiny things, SYD, Tesla on September 13, 2008 by Gidge Uriza.